View More In Instrument Sets. EXCELLENT QUALITY GERMAN STEEL ( GUARANTEED MONEY BACK ) NO CAMPROMISE IN QUALITY NEW GERMAN GRADE Sinus Lift Osteotomes Kit Straight Off Set Concave Dental Set of 12pcs Sinus Lift Instruments, Dental Implant Instruments. 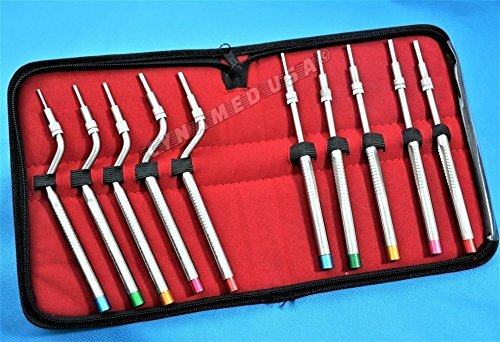 Deal Includes: - 5pcs Sinus Lift Osteotomes Straight (Concave / Convex) - 5pcs Sinus Lift Osteotomes Off Set (Concave / Convex) - 1pc Solid Stainless Steel Bone Mead Mallet Sizes: 2.8mm, 3.2mm, 3.8mm, 4.5mm & 5.0mm Depth Markings: 8mm, 10mm, 13mm, 15mm, 17mm & 20mm Color Coded Instruments for identification. Applications: Used to Carry & place Bone Grafting material into site of the Elevated Sinus Floor. Used to Transport the Bone during surgery. Used to condense Bone material under the Sinus. Used for Conservative Placement of Maxillary Implants using a "Socket Lift" Procedure Ideal Instruments during Sinus Lift Surgery Color-coded ends Ease identification. Quality Handcrafted to Perfection. Retail Value >599USD! ASTM STANDARD 304 TYPE STAINLESS STEEL BRANDED CYNAMED USA High quality Medical Standard German GERMAN GRADE Autoclavebale and Sterilizable. EXCELLENT QUALITY GERMAN STEEL ( GUARANTEED MONEY BACK ) NO CAMPROMISE IN QUALITY NEW GERMAN GRADE Sinus Lift Osteotomes Kit Straight Off Set Concave Dental Set of 12pcs Sinus Lift Instruments, Dental Implant Instruments. Deal Includes: - 5pcs Sinus Lift Osteotomes Straight (Concave / Convex) - 5pcs Sinus Lift Osteotomes Off Set (Concave / Convex) - 1pc Solid Stainless Steel Bone Mead Mallet Sizes: 2.8mm, 3.2mm, 3.8mm, 4.5mm & 5.0mm Depth Markings: 8mm, 10mm, 13mm, 15mm, 17mm & 20mm Color Coded Instruments for identification. If you have any questions about this product by Cynamedusa, contact us by completing and submitting the form below. If you are looking for a specif part number, please include it with your message.